Reading has been a part of who I am as far as I can remember. I loved listening to books as a curious child and enjoyed an audience when learning to read on my own. During grad school research, I often found myself curiously digging into one topic that led me on a seekers journey and no closer to completing my project. Maybe that was procrastinating...but nevertheless it nourished my thirst for knowledge and understanding. Most of my reading these days is for leisure rather than work. I admit to having read the entire Mitford series by Jan Karon, People Magazine (especially love the second look puzzles), any book written by Anne Lamott. Tattoos on the Heart by Gregory Boyle recently left me with a deeper understanding of the human condition. While these easy reads add little to my professional knowledge, they do provide me with a screen-free escape and feed my spirit. My RFC family is a little different. When I asked my colleagues about their favorite reads, their responses were astounding! I knew my coworkers were more that a group of mindless, movement crazed jocks, but after hearing their responses, I realized I'm surrounded by nerds. Peter Donlon, Angie Cali Fernandez, and Lisa Hinkle curb their curiosity with Medicine in Science in Sports and Exercise journal published by the American College of Sports Medicine (ACSM). IDEA fitness journal has provided Pam Cole with up-to-date fitness research for over 15 years. Celeste Cooper-Peel is a self-proclaimed research junkie. She enjoys books and podcasts and has a fav list of peer reviewed resources on health, wellness, and integrative medicine: Google Scholar, PubMed, Journal of the American Medical Association, The New England Journal of Medicine, Alternative and Integrative Medicine, Journal of Evidence-Based Integrative Medicine. Leigh Howell believes in efficiency and the streamlined process. The Power of Moments by Chip and Dan Heath coaches readers to create moments that will build your memories, your life, and your company. Cheryl Wheelock relies on several books and has just started listening to podcasts. Her most interesting read, ROAR, by Stacy Sims and Selene Yeager is discusses female physiology in sport. This resource has been helpful with her personal cycling and she uses it professionally with clients. Cameron Gatlin's go to sport for all things hiking is www.alltrails.com with trail specs and user posts to help you plan your next adventure. Squat University keeps Kasey Joiner up to date on trends and creative ideas for classes. She has been following functional movement trainer Aaron Horschig for a year. He provides great advice on helping clients and athletes move better and pain free. 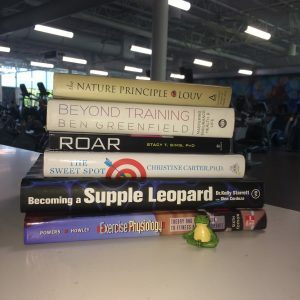 Amanda Pack loves a good book and mentioned four of her favs when asked about her go tos for fitness, wellness, and recreation. Beyond Training: Mastering Endurance, Health, and Life by Ben Greenfield is loaded with exercise and physiological science and some pretty out-there antics, but it’s quite an interesting read. The Brave Athlete: Calm the F*ck Down and Rise to the Occasion by Lesley Paterson and Dr. Simon Marshall. Please excuse the title, but WOW! Hello neurology and psychology of our inner crazy! Written by a pro triathlete and her professor husband, this book is both entertaining as well as enlightening regarding the neuroscience and psychology of sport. And the last two, The Sweet Spot by Dr. Christine Carter, and Charles Duhigg's The Power of Habit you've seen before on SAS Life - two interesting, science backed instructionals on habits and habit change. Benny Saint Romain uses Aquatics International among other research journals and websites for all aspects of aquatics, best practices, and trends in the aquatic industry. As a competitive triathlete, Ryan Wands's reads evoke the competitive nature. Ryan refers to Dr. Kelly Starrett's Becoming a Supple Leopard for physiology and mobility info and Mark Divine's The Unbeatable Mind for useful info on meditation and the athletic mental game. My latest fitness/wellness related read is Body Kindness by Rebecca Scritchfield, RD. Besides loving reading another Rebecca, this book encourages readers to see their own bodies with eyes of love and grace. At some point in our lives, most of us experience a challenge with our reflection and this book provides an excellent insight on our relationship with our appearance. I highly recommend reading Body Kindness anytime, but specifically if your body is going through changes or if you want to temper the love-hate with your reflection. Speaking of reading...Did you know the single most significant factor influencing a child’s early educational success is being read to at home prior to beginning school? Books ignite imagination and introduce children to the world of words. According to the Educational Testing service the more types of reading materials there are in the home, the higher students are in reading proficiency. Many children don’t have access to books at home and we can work to change that. Ensuring that books are available to any child at any time is a good step towards our future. This year, SAS is concentrating its #GivingTuesday efforts towards promoting literacy with a book drive and reading to children. How can you help get books to kids who need them most? Drop off your new or gently used children's books at the RFC between October 8 - November 27, at the SAS Championship, or, visit the Y Learning Amazon Wish List to purchase a book that will go directly into the hands of a child in one of the Triangle’s Y Learning programs. At the RFC, for each book you donate, you can swap for 2 books at the RFC Book Exchange - another great place to pick up books to satisfy your curiosity! Oh boy! Thanks for the suggestions, Rebecca. I'm a life long lover of reading, and I'll pretty much read *anything* you put in front of me. =) I love the GivingTuesday focus on books for kids who otherwise wouldn't have them. Life altering! !